A look back at how the United States racially segregated its newly created 1950s and 1960s suburban communities. Housing is the largest component of wealth for most American families. African Americans have been historically less likely to be homeowners and their homes, on average, tend to be less valuable than those of White Americans, depending on the metropolitan area or region. The reason for these disparities can be traced directly back to deliberate government policies and programs that predominantly provided homeownership only to White Americans and helped leapfrog many White Americans into the middle class. 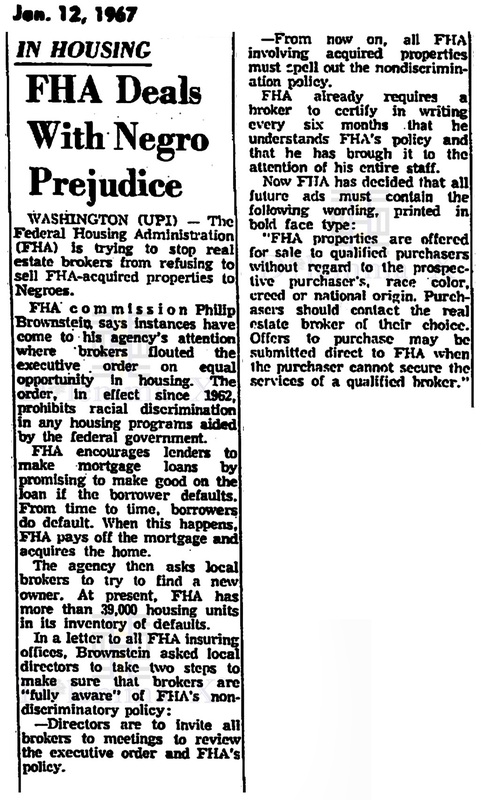 The Federal Housing Administration (FHA) set itself up as the protector of the all-White-American neighborhood by implementing several racially restrictive policies. During the Great Depression no massive home construction took place in the United States. After President Franklin D. Roosevelt took office on March 4, 1933, the Public Works Administration began to build the first civilian public housing in the country, because there was an enormous housing shortage. The Public Works Administration program and housing was primarily designed to provide housing to white middle-class/lower-middle class families with very little for African Americans. African Americans received no massive federal housing help before the New Deal and when African Americans did, it was a state-sponsored system of segregation. The National Housing Act of 1934 created the Federal Housing Administration (FHA), which was established primarily to increase home construction and create construction jobs. It redlined urban communities. Redlining is the systematic denial of various services to residents of specific, often racially associated, neighborhoods or communities, either directly or through the selective raising of prices to keep a certain population out. The Federal Housing Administration subsidized mass-production builders of entire subdivisions and entire suburbs. 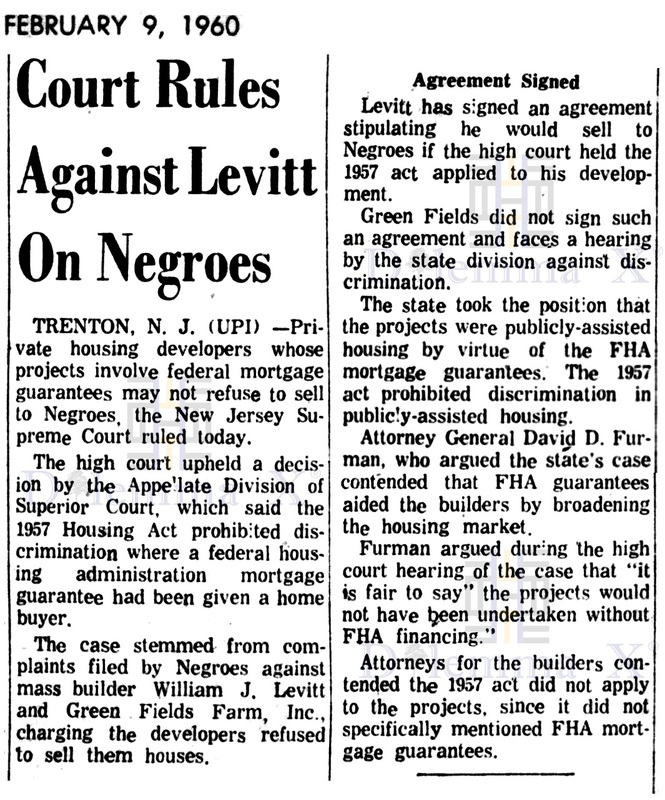 The FHA did so with a requirement that no homes be sold to African Americans and that every home in these subdivisions had a clause in the deed that prohibited resale to African Americans. This created all white suburbs around the cities across the entire nation. The Housing Act of 1937 (enacted September 1, 1937), formally the “United States Housing Act of 1937” (Wagner-Steagall Act), provided for subsidies to be paid from the U.S. government to local public housing agencies (LHAs) to improve living conditions for low-income families. These created racially segregated public housing project across the United States. After World War II, during America’s post-war prosperity, the Baby Boomer Generation was born and their parents had a major affordable housing crisis. Their parents no longer wanted to live in the crowed cities or cities that had little new housing options. From 1935 through 1951, almost 4 million new dwelling units were financed with mortgage loans insured by the Federal Housing Administration (FHA) or guaranteed by the Veterans Administration (VA loan). This number represents about 40 per cent of all new dwelling units built during this period, and equals more than half the entire volume constructed during the 1920s. Of the 4 million dwelling units, over 2.4 million were financed with FHA and VA loans made during the 6 postwar years 1946 to 1951. In 1915 the home loan guarantee provisions of the Veterans Administration, under the Servicemen’s Readjustment Act of 1944, began to operate. Nevertheless, the relative importance of the FHA and VA loan programs combined was low in 1945 and 1946, accounting for only 23 per cent of the total number of dwelling units started. From 1947 through 1951, however, approximately one-half of all privately financed new dwelling units were acquired with loans insured FHA or guaranteed VA loans, as against the maximum of one-third before World War II under the FHA program alone. The increased proportion of construction under these government aids was accompanied or preceded by the introduction of more liberal credit or guaranty terms for both FHA and VA loan mortgages, until the Korean War conflict caused the introduction of credit curbs in the summer and fall of 1950. The credit restrictions and the withdrawal of rigid Federal Reserve support of government securities, which tended to raise bond yields and made investment in FHA and VA loans at fixed maximum interest rates less attractive, account for the decline in the proportion of new dwelling units financed with government insured mortgages from 1950 to 1951. In 1965, the FHA was merged with the Department of Housing and Urban Development(HUD). The Levitt & Sons, a major real estate development company, was founded by Abraham Levitt near the start of the Great Depression. His son William Levitt became company president while still in his early 20s. Abraham Levitt was the son of Russian-Jewish immigrants. Abraham Levitt was in business for some 25 years before he made his first tentative move into building construction around 1929. The family lived in a brownstone in Brooklyn’s Bedford-Stuyvesant section. When Abraham Levitt learned that a New York black district attorney was moving into the area, he told his family that if this African American man moves into the community, the entire community will become majority black. This would make it more challenging to sell the house for a good price, if at all. Abraham Levitt sold his the home and moved the family to suburban Long Island, New York. As African Americans moved from the southeastern states into New York City, whites who could afford to leave New York City moved to the new Long Island suburbs. By 1934, the Levitts had built a 200 unit subdivision on Long Island, called Strathmore. There were some reports that the Jewish Levitt actually barred Jews from Strathmore, his first pre-Levittown development on Long Island in New York. Although Levitt donated millions of dollars to Jewish charities. Suburbs developed rapidly in response to the return of post-World War II white veterans, who had GI Bill financing to back them. 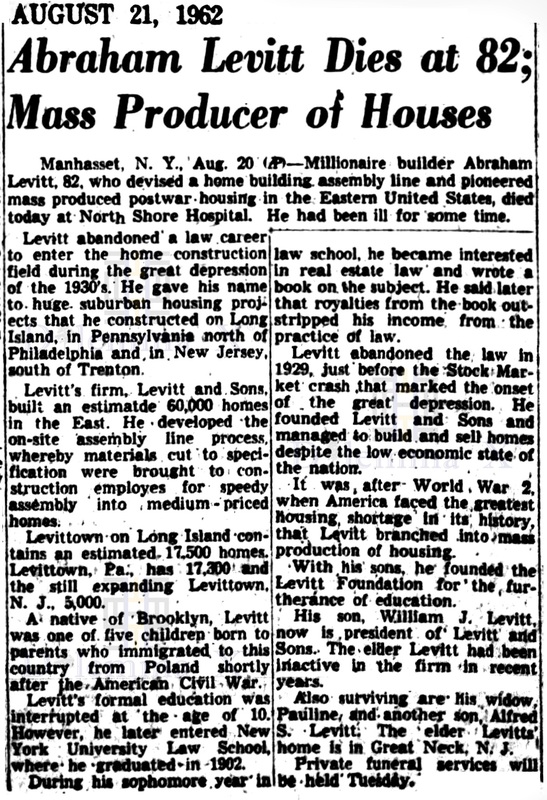 Levitt & Sons created for many returning World War II soldiers, what many considered, the new American dream. The company created the opportunity for people to leave the cramped density of the 1940s cities and experience the first American suburban homeownership by developing mass-produced suburbs on unused farmland or wooded areas. 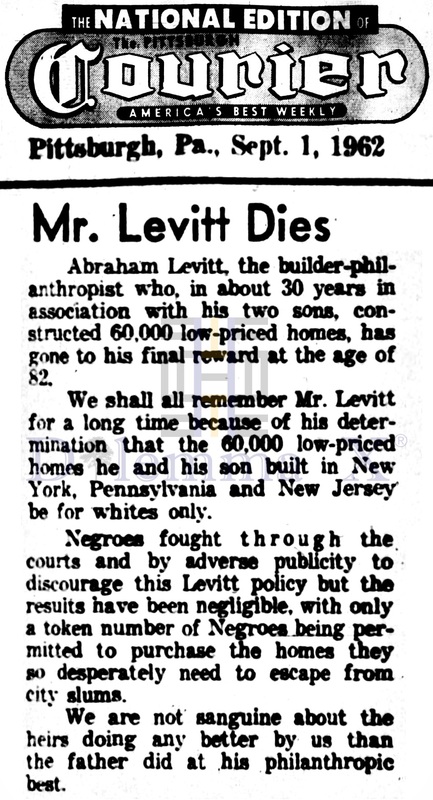 Abraham Levitt banned on African Americans due to racism and his business beliefs. 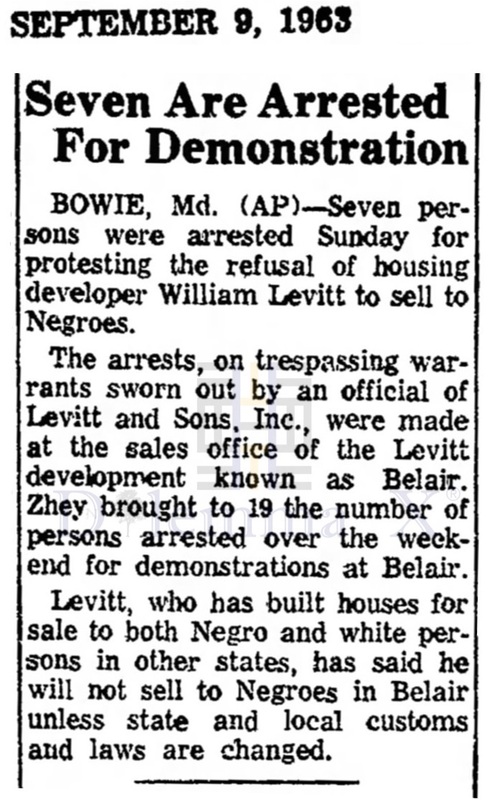 Levitt felt that the majority of young white Americans, who were the parents of the then new Baby Boomer generation, would not buy his homes if African Americans were allowed to live in these new suburban communities. 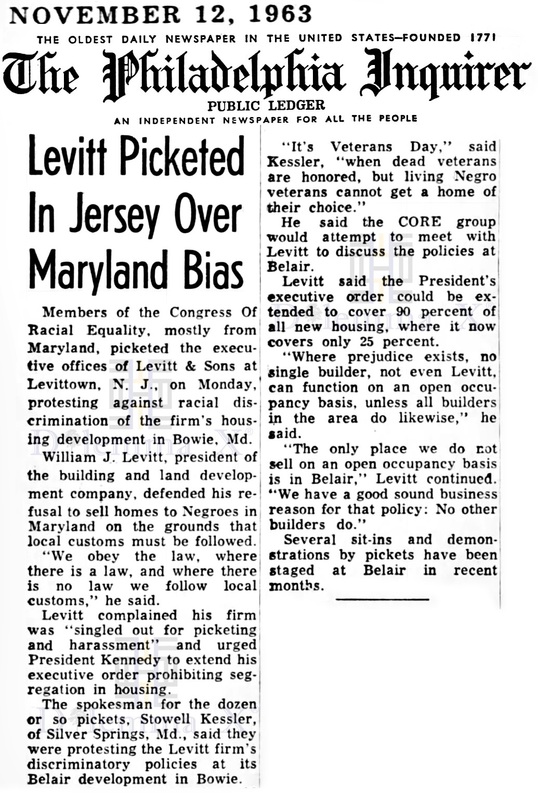 Levitt believed African Americans would bring the housing values down, even if the African Americans could afford the mortgages. 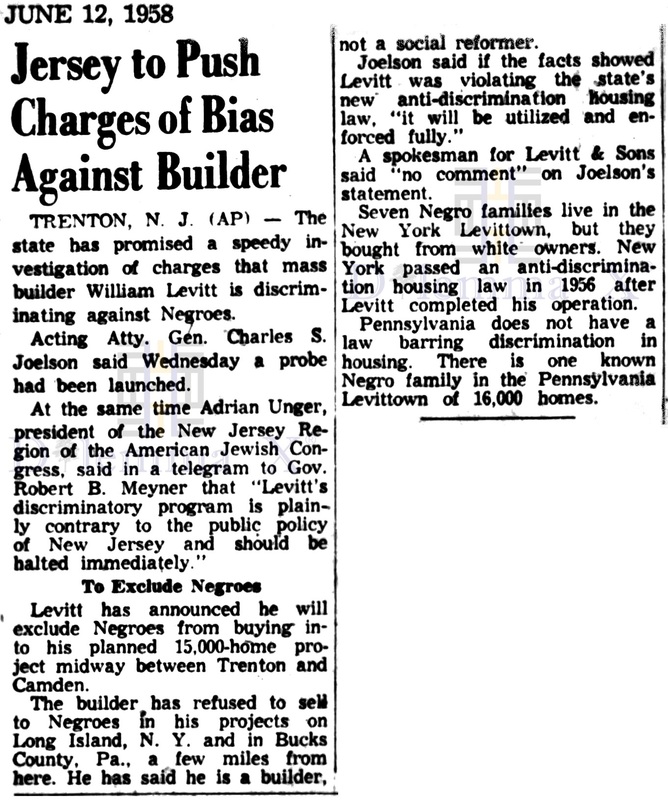 In July 1957, Bea and Lew Wechsler, a Jewish couple from the Bronx, challenged Levitt’s restrictive covenant by arranging for the private sale of the house next door to them in the Pennsylvania Levittown to an African American family. As soon as Bill and Daisy Myers and their two children moved in, they were confronted by threatening phone calls and hostile, rock-throwing neighbors. Over the next few months, local vigilantes mobbed neighborhood streets and stoned a local police sergeant who was assigned to protect the Myers family; Confederate flags, purchased at the area’s Shop-O-Rama, began to fly in neighbors’ cars and windows, crosses were burned on lawns. 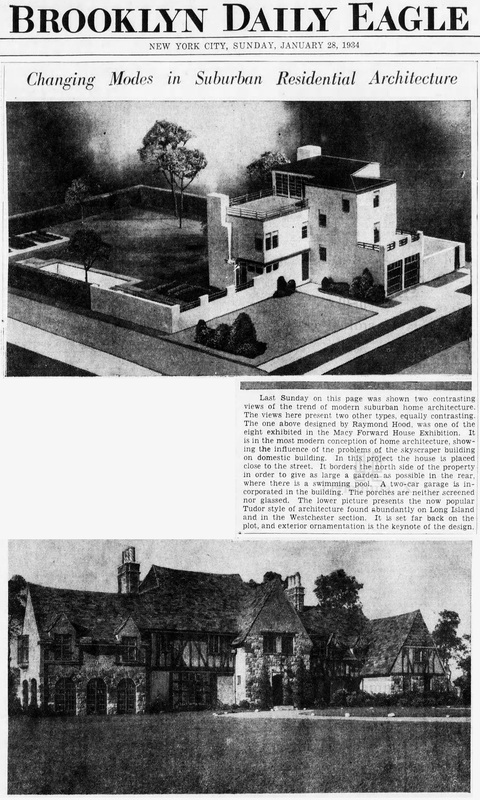 Below are just a few historical newspaper articles showing how Levitt & Sons built white only suburban developments. Many of these communities, even in 2018, are still extremely not racially diverse and are mostly white populated. Please click the images below to enlarge for better viewing. Click your return arrow to return to this topic.